"All units are ready for effective efforts to restore the affected areas of Donbas." 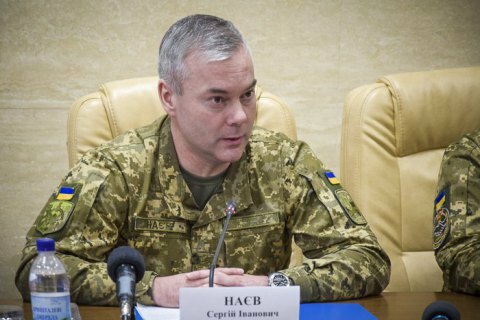 Joint Forces Commander Serhiy Nayev has said that units of the Interior Ministry, the National Guard and the National Police engaged in the antiterrorist operation, which will soon be subordinated to the Joint Operational Staff of the Ukrainian Armed Forces, are up for the task. Speaking in an interview with the Fakty daily, he said that "all units of uniformed agencies and regional administrations of Luhansk and Donetsk regions are ready for effective efforts to restore" the affected areas of Donbas. "The troops have enough capacity to ensure safe conditions for this process. Together with the heads of the regional administration, we have long known each other, we know, understand and respect each other. I am confident we will be working in close coordination because we have a common goal of supporting Donbas residents and helping them to return to normal peaceful life," he said. He suggested the authorities should be "striving to relax crossing rules" on the line of contact. "This notional administrative line is crossed by dozens of thousands of people every day, who que there in cold, wind, heat or rain. I hope the time will come and checkpoints will no longer be part of our landscape. I would like to stress that the end goal is a full reintegration of Donbas without any dividing lines," he said. The government antiterrorist operation in Donbas finishes on 30 April and the operation of the Joint Forces begins.